Small - $39.99 Only 1 left! Let’s face it: Love can make you do some seriously crazy things. And in the case of ol’ Harleen Frances Quinzel, M.D., sometimes it came make you go literally crazy! Sure, we’ve all been attracted to a bad boy or two, and Harleen isn’t the first woman in the world who’s ignored all the good sense in the world when it comes to pursuing someone who's so messed up that they’ve literally been locked away for the good of society (for instance, let’s talk about the fact that Ted Bundy, Charles Mansen, and one half of the Menendez brothers actually got more female admirers after they went to jail for their their heinous crimes…wait, on second thought? Let’s not!). Sometimes, when you’re in the thick of it - like, say, putting your hard-earned professional credentials in jeopardy for an insane person who, by all accounts, meets all the criteria of a psychopath - you do things that just don’t make sense! But it's fine! We get it! Love itself is crazy! There's literally a release of hormones to the brain when you fall in love that mirror the effects of drugs...who could argue that you're still supposed to act totally normal and sane when something like that happens? And yeah, maybe not all of us decide to shed our old identities - and our old wardrobe - in favor of becoming Harley Quinn and wearing this Women's Harley Quinn Romper, but it's an insane out world out there, and you're just livin' in it, sister! 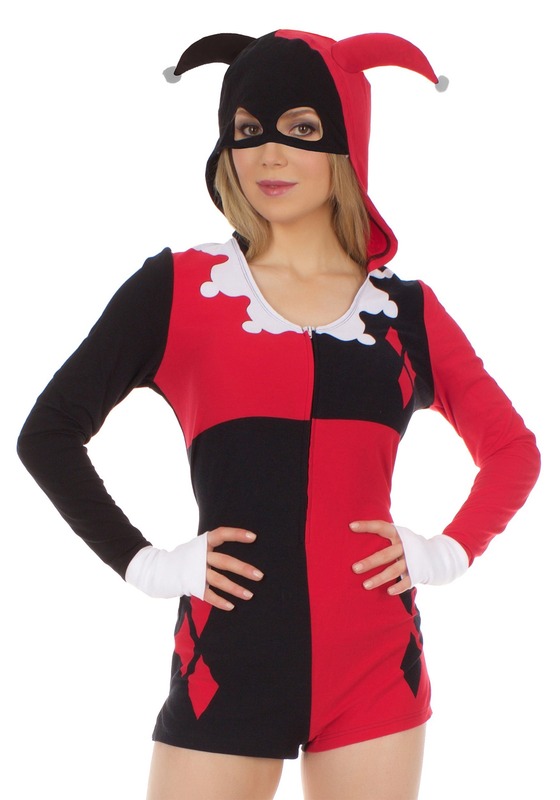 So you might as well slip on this officially licensed romper, pull down the hood to show the half mask, and get to doing some tricks for your treat, the Joker. After all, you said it yourself, kid - you might look like a doll, but you're dangerous. And the world is waiting for you to show them just how dark you can be! Exactly as described. Excellent fit. Comfortable.